Mike Nattrass MEP has a public meeting each evening next week and with the local PPC in each case. Everyone is welcome to attend. There may be local issues to address. If you would like to attend or tell others please do. Mike will explain about the power of the EU and why he is an MEP but these meetings depend on questions. Previous ones have gone well.... he hopes these meetings educate a few constituents about the policies of UKIP MEPs or perhaps they will educate him! Especially in relation to local issues. The locations are listed below. Plus a premature mention of the Stourbridge meeting in March. Not exactly an accurate headline from The Times, she is the EU's representative, but the sentiment is correct as the article says. It would seem that the Labour peer spends more time on the Eurostar commuting home to London than in her office, where nobody answers the phone after 8pm. Too bad when the caller is Hillary Clinton saying that she’s on her way to Haiti. Was Catherine en route? No. On Friday January 15, she had cancelled all appointments to go home earlier. José Manuel Barroso had to send Karel De Gucht, the Development Commissioner. A few days later, Lady Ashton tried to defend herself. Her arguments fell decidedly flat: “I’m neither a doctor nor a fireman.” Indeed, but surely she must know that diplomacy at this level implies symbolic gestures and fast action. The EU has committed four times more in aid to Haiti than the US, so it would have been logical, if not crucial for Europe’s image that its Foreign Affairs Minister stood alongside the Secretary of State. UKIP are fighting two council By Elections in the Buckingham Constituency Area and urgently need your help over the next few days in order to achieve the best possible results. The results in these By Elections are an important part of the build up to winning the Westminster seat. Please come along and help if you possibly can. Did you know that the EU has been secretly handing over EU citizens banking details to the US. It has now come to light because a row is brewing as to whether it should continue. The European Parliament will next month vote on the agreement — and could scupper data-sharing, if the legislators oppose a temporary deal that EU governments want in place for nine months while they negotiate a fuller and longer-term accord with the U.S. Such a deal would formalize a secret program launched in the wake of the Sept. 11, 2001, terror attacks that skirted Europe's strict privacy rules. It did that by transferring millions of pieces of personal information from the U.S. offices of the bank transfer company SWIFT to American authorities. Go to title link for full stroty. As lawmakers in France openly recommend a ban on full veils, people in Britain believe that garments that cover the face should also be outlawed in the United Kingdom, a new Angus Reid Public Opinion poll has found. The online survey of a representative national sample of 2,001 British adults showed respondents pictures of three different garments—the burqa, the niqab and the hijab—and asked whether their use should be forbidden in the UK under three specific scenarios. The burqa is an outer garment worn by some Muslim women that is meant to conceal the entire body. In addition to a full veil, the burqa usually features a net that covers the eyes. More than 70 per cent of respondents would agree with banning the burqa in public places (72%), at schools and universities (79%) and at airports. The niqab is also meant to conceal the entire body and also features a full veil, but differs from the burqa because the eyes are usually exposed. Two thirds of Britons (66%) would ban the niqab in public places, while higher proportions would forbid the use of the garment at schools and universities (75%) and airports (85%). The hijab is a type of head scarf that usually exposes the entire face. A majority of respondents believe the hijab should not be banned at airports (63%), schools and universities (69%) or in public places (75%). While two thirds of Britons (67%) believe that garments that conceal a woman’s face are an affront to British values, a majority of respondents (58%) claim the Government should not be allowed to tell individuals what they can and cannot wear. It would appear not for the first time the public are at odds with themselves, and whilst the prejudice amongst society may well see the 70% as vindication of a ban policy clearly, when push comes to shove the public don't like bans. For complete survey click on title link. Nikki Sinclaire has been instructed by the UKIP NEC to stop using the party name and intellectual property and banned from attending UKIP meetings after she resigned from the EFD group that UKIP formed in the EU Parliament and the ensuing media frenzy. All MEP candidates had to sign an agreement before they could stand under the UKIP banner to join whatever group UKIP formed in the EU Parliament. Nikki signed this agreement but later felt that she couldn't remain in a group that contained parties that had values she was opposed to - homophobia, anti-semitism, etc. - and resigned from the group. The views on this amongst the membership are varied - some believe that she signed an agreement to join a group, received support from the party as a result and should stick to that agreement whilst others believe she is making a principled stand and should be allowed to leave the group. From what I've seen, the internet activists lean more towards the latter, whilst the member on the street seems to lean more towards the former. Why this should be the case I don't know, I'm sure a psychologist could explain. There is usually a fall-back position for Councillors, MPs or MEPs that have had the party whip withdrawn but haven't been expelled from their party in that they would describe themselves as "Independent UKIP" but that doesn't appear to be an option for Nikki as she's been told to stop using the UKIP name even though she remains a UKIP member. As things stand at the moment we as members don't know the full story. We have rumours and conflicting stories from both camps but what we don't have is an understanding of exactly what is going on here. Resigning from the EFD group clearly isn't the only reason for the actions of the NEC - that's like cracking a walnut with a sledge hammer - so there must be more to it and until this is all done and dusted we aren't going to find out what's going on. On one hand we must have faith in Lord Pearson and the NEC who we elected to lead the party but we must also question their decisions when it is clear that it is driving a wedge in the membership. If Nikki has been, in effect, suspended from UKIP then we as members should at least be given clarification on her status and when details will be available. Leaving the rumour mill and anti-UKIP trolls like Junius and Greg Limp-Wrist to fill the void will make matters worse. Clearly we can't expect details because it's an ongoing (disciplinary?) matter but vagueness encourages rumour and discontent and with a general election looming, the last thing we need to be doing is fighting each other instead of the europhile establishment. I would also suggest that the NEC and Nikki both stop airing their dirty linen in public. If the matter is too private for members to know what's going on, we shouldn't be reading snippets in the newspapers. Former NEC member, MEP-in-waiting and UKIP parish councillor, Jill Seymour, is standing in the upcoming by-election for the Shifnal Rural ward. A leafleting session has been arranged for today and members from all over the West Midlands euroregion will be in Shifnal to help out. If you are at a loose end today, feel free to come along (I'll be there). The meeting point is the car park behind the Co-op on Shifnal High Street. Meeting time is 11:30am and maps will be provided. For a map of the location, click here. UKIP's Godfrey bloom talks to Alex Jones about global government, the EU's corpus juris, common law, global warming, QUANGOs, Common Purpose, bankers, swine flu and Gordon Brown - amongst other things. Bloom described Gordon Brown as "a dysfunctional individual", to which Jones added "there's something wrong with that man", "he's some kind of freak"! Alex says of UKIP, "these guys have really got it right". Well, there's an endorsement! Branch Chairman Greg Heathcliffe, said, " Despite the cold and damp conditions we collected over 100 signatures and handed out a lot of leaflets. This was a good first time effort which will be repeated in the coming months. I would like to thank those members who gave up their time for this event." Why have you not made any comment on the terrible abuse of Nikki Sinclair by Nigel Farage and other senior party officials. Do you lead UKIP or not. Nikki says you fully supported her decision to leave the EFD, if true, why have you not called a halt to the on going character assassination. I have today received a reply which I cannot disclose other than to say the possibility of justice being done exists. I cannot say more than that at this time, in deference to a request in the email. I am content at this time, but will report as soon as I am able to. Veil of Ignorance: Burka's Is this a step too far. Aside from the fact that once again a policy announcement has been made without any consultation with the membership, is this call to ban the Burka simply pandering to those who might just vote BNP. This is the question posed in a Times editorial. (click on title link. I speak as a UKIP member who believes in fairness, tolerance and democracy. As someone who comes from a mixed race back ground, my father was Spanish, it was not easy growing up with the 'w*p', w*g, jibes but one learnt very early on that these reactions were from a base of ignorance. That said more about the adults /parents than of my peers, using the language. I am British and I am proud to be so, many of us within the party warned that the agenda for UKIP would change were Lord Pearson of Rannoch to be elected Leader, given his somewhat ill thought out comments on Islam and Muslim women. I do not believe that a total ban is the answer. 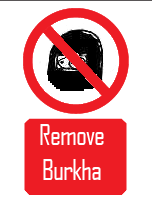 I believe that anywhere where other forms of facial covering is deemed unacceptable, banks, building society, airports etc then it should only be right that the same applies to burka's. "It is, ( I prefer to ask Is it) therefore, stirring racial discontent, for its own electoral benefit and this is reprehensible. Calling for withdrawal from the EU is respectable, if wrong-headed. Increasing fear and misunderstanding between communities is not." I think in future we as front line members interacting with our peers will now find it just a touch more difficult to convince the public we are not the BNP in Blazers. These are personal views as a member of UKIP and are not the necessarily the views of my branch. Congratulations go to Nikki who despite the aggression shown her by the presenter and allowing Ian Dale to have a go at her she got her point across. She named names where she was allowed. Pointing out how Lord Pearson had given his assurance that she could remain within UKIP, she called upon him to show leadership by making a statement. As an aside I have still not received a reply to the email I sent him. The Guardian Associate Editor agree with Nikki that the some of groups within EFD were very extremist. All in all despite the clear BBC agenda to put her down. I believe she has shown her commitment to UKIP. What was interesting once again, is that the NEC has not followed party rules with the actions they have taken. Let's wait to see them spin this. I've put the daily politics link in the header, the interview should appear there soon. I think it is important that both sides of this story be told. Click on the link to Paul Nuttalls statement above. 1. Entry was made to Nikki Sinclaire's office on Tuesday morning by a party official. 2. An office junior was present who was distressed by the sudden, unannouced entry. 3. The party offical advised both Nikki and the office junior that they were acting on direct instructions of the NEC. 5. The office junior telephoned Nikki's Brussels office to inform Nikki of the entry. 6. Nikki was not given any prior warning and no request was made to her to hand over any items of property. 6. Nikki made contact with the party official who had removed the items and they were then returned to the office. The NEC asked an officer of the party to remove UKIP equipment from the office of Nikki Sinclaire believing it was jointly occupied with Mike Nattrass MEP. The officer in question visited the office, spoke to a member of staff, confirmed that nothing belonging to UKIP was present and left. Nothing was removed from the office. I don't think this will be making the front page of Private Eye any time soon. We note your concern that UKIP has not been invited to take part in the planned Prime Ministerial Debates. You’re twisting things with your very first sentence. My concern was that once again UKIP is being kept out of the debates. Calling them Prime Ministerial debates is your way of keeping the 4th party out. If the BBC seriously want to argue that Nick Clegg can be Prime Minister, then please explain where those 200+ gains are going to come from. during the coming General Election campaign for the Westminster Parliament. Westminster had agreed, in principle, to the broadcasters’ proposal. This is basically a repetition of what you’ve already said – but interesting to note the use of the word “proposal”. Proposal to whom? The state? The British public? Because if either were the case there are a great number of questions that would then follow. in each of the nations – have yet to be agreed. Ah ok….so Plaid Cymru, who only contest 40 constituencies, and who live in a part of the UK where power is already considerably devolved, will get a full hearing. But UKIP, who are contesting 500+ constituencies WON’T? And you consider this fair? in 2010, the starting point is the last General Election, in 2005. As I told you in my original letter, and reminded you with my second response – this “argument from incumbency” is not only heavily biased in favour of the status quo, but demonstrates again the “innate bias” which the BBC has more than once quietly admitted. election as the Labour, Conservative and Liberal Democrat parties. This is just utter fiction. Anyone who was involved in ,or followed last June’s election knows that UKIP didn’t receive equal coverage. By ramping up your lies in this fashion, you are showing that the BBC really is fighting a war of propaganda. of the vote and won no representation at Westminster. Is it surprising that UKIP suffered in the polls when the free coverage awarded to the incumbents was denied them? You essentially kept them off the TV. There’s your other big twist. Initially it was to be a debate “between those party leaders who aspire to be Prime Minister” (which I’m sure would include Malcolm Pearson anyway), now you change it to “those parties which have substantial electoral support”. Once again you aptly demonstrate that the BBC is inconsistent, corrupt and immoral. I invite you to respond to the points I have made here. An outspoken councillor switch in allegiances shook up Sutton Borough Council politics today. St Helier Councillor David Theobald quit as an Independent to join UKIP. The move means UKIP now have a total of two councillors in the Borough as he joins fellow colleague, Belmont UKIP Cllr David Pickles. Cllr Theobald, 51, said: “I do not perceive UKIP as a party of the right, left or centre, but see it as a broad spectrum and I will continue to exercise my moderate left of centre ethics. “I have enjoyed many debates and conversations with Cllr Pickles over the past few years and have found that, despite opposing views on some issues we can always find common ground and a viable road forward”. Frank Day, chairman of UKIP Sutton Borough branch, who is the parliamentary candidate for Carshalton and Wallington at the coming general election, said he was “delighted at the news”. We have just had it confirmed that Nikki Sinclaire MEP has resigned from the Europe of Freedom & Democracy (EFD) group in the EU Parliament. Nikki was uncomfortable with the EFD group from day one for understandable reasons. Some of the members of the EFD group are, if not homophobic, not exactly complimentary of homosexuality. There are 27 countries in the European Empire and what may be considered unacceptable to most people in one country isn't necessarily considered unacceptable to most people in another country and in the case of some of UKIP's Eastern European partners in the EFD group, their views on homosexuality are a case in point. I can fully understand Nikki's feelings on the group although it's a shame no compromise could be found that would have enabled her to stay in the EFD grouping with her fellow UKIP MEPs. I am sure she will continue to work for UKIP, for the country and most importantly, for the people in the West Midlands that voted for her to represent them in the EU Parliament. Edit: Apologies for the post disappearing overnight, I assume it was deleted in error. David Cameron wants you to negate yourself, according to Richard Reeves, director of the neo-Marxist think tank Demos. That Britain’s next ‘conservative’ Prime Minister has been fraternising with this far-left Fabianist fifth-column, has been common knowledge amongst those in the know for some time. But that the Telegraph would echo such strong collectivist propaganda as this, and promote it as Editor’s Choice, is perhaps a little shocking. So after “decades of neglect” of the state’s cultivation of the personality of the people (I beg to differ), Reeves and Cameron have decided to lay out the attributes which are most desirable to their “new agenda for character education” – summed up by the “ability to put the needs of others before your own”. Such blatant calls for self-sacrifice cannot be sanctioned, and so I defer to Ayn Rand, who remains the world heavy-weight champion debunker of altruism. that beneficiary is anybody other than oneself, anything goes. So the “test of character” posed to the British people is “how selfless can you be for the public good”? This is an indictment of moral vacuity, and as clear a sign as any that it is dangerous to underestimate quite how evil the next government will be – regardless of who wins, since even Reeves admits “both the main parties…promote social responsibility”. ‘Evil?’ I hear you ask. ‘What could be more evil?’ I retort. You are being prescribed sacrifice of your livelihood and your moral code, and then told such an action is the height of morality. The two parties who are vying to form government are now clearly trying to outdo one another in the altruism stakes. Gone is any believable rhetoric about freedom, prosperity, or even the cliché of ‘change’, from British politics. This election will be fought between rival cabals of corporatist interest as to whom can construct the most effective socialist technocracy. As for the grit crisis I wrote about in my last piece- well that has nothing to do with salt, but everything to do with character, according to Reeves – the implicit suggestion being of course, that any sector of the economy, be it rock salt distribution or the socialised health system, can be improved if only us individuals are willing to sacrifice ourselves. I hope for my sake that you’re not. "The Conservative Party no longer represents real conservative values" says Ramsey Councillor as he defects to UKIP. Cllr Andy Monk, who was elected as a Conservative to represent Ramsey on the Huntingdonshire District Council, has today (11th January) announced his defection to the UK Independence Party (UKIP). Cllr Monk joins Cllr Peter Reeve, who won the double by-election for UKIP in July 2009 and represents Ramsey on the District Council as well as being a Cambridgeshire County Councillor. They will now be establishing a UKIP Group on the Huntingdonshire District Council. Cllr Monk says "I am very pleased to have joined UKIP. Like many other Conservative members, I have agreed with UKIP on the key issues for many years. I really do feel that the current leadership of the Conservative Party no longer represents real conservative values and that local Conservative leaders do not allow their councillors the freedom to properly represent the local community. "In contrast UKIP strongly champions the local community and is the real voice of local people. That is why I entered politics and it was because I promised to listen to local people that I was elected in April 2009 and it is why I have decided to join UKIP now." UKIP Deputy Leader and MEP for the East of England, David Campbell-Bannerman said: "We are delighted that Cllr Monk has joined UKIP. Our political influence and support in Cambridgeshire is growing fast, as it is around the country because we are the only Party with real common sense policies. We expect our councillors to work very hard for the local community and Andy has risen to the challenge. He joins a fast growing band of UKIP Councillors fighting to challenge the complacent career politicians who no longer listen to the ordinary man in the street." The English Democrats have formed an unholy alliance with some other minor parties and called it the Alliance for Democracy. Joining the English Democrats in their "Anglo-Christian Democratic Alliance of Political Parties" are the Christian Party "Proclaiming Christ's Lordship", Jury Team, Popular Alliance, the UK Fascist First Party and Veritas. Strangely absent are the England First Party, a BNP off-shoot that the English Democrats formed an electoral pact with during the 2009 EU elections. The Christian Party ... well, what can I say? The Christian Party is headed up by a Scottish Reverend and has a homophobic, anti-abortion, illiberal manifesto. As well as the UK Christian Party, there is a Christian Party Scotland and Christian Party Wales - something the English Democrats criticise other British political parties for! Jury Team isn't even a proper party, it's just a rich bloke paying deposits for no-hopers who can't make it onto a party list. Jury Team candidates collectively gained only half a percent of the national vote between them in the 2009 EU elections. The Popular Alliance is an off-shoot of UKIP and Veritas, itself an off-shoot of UKIP. The Popular Alliance has a policy to "restore British culture, tradition and history, especially in schools". Their website describes them as a "Political party opposing Labour, Conservative, Lib Dem, UKIP, Veritas and BNP as an alternative for government". The UK First Party is yet another UKIP off-shoot and already has an alliance with the Popular Alliance. The UK First leadership and its handful of activists consist mainly of disgruntled former UKIP members including Greg Limp-Wrist, one of the EU moles who writes on the anti-UKIP "Junius" blog. Veritas is the original UKIP off-shoot, formed by Robert Kiljoy-Slick when he threw his teddy out of the pram after failing to get himself installed as leader. Veritas' biggest achievement is to still be in business despite having virtually no success in its 5 year history. Robert Kiljoy-Slick once tried to take over the English Democrats but failed. The combined vote in the 2009 EU elections of every party in the Alliance for Democracy (Veritas and Popular Alliance didn't stand any candidates) was just 4.4% - 1.8% less than the BNP, slightly over half the Green vote and just over a quarter of the UKIP vote. Three of the six parties in the Alliance for Democracy are UKIP off-shoots, one of them is specifically opposed to one of the others, one of them has a "British" party to cover England with local parties for Scotland, Wales and Northern Ireland and all of them except the English Democrats are UK parties. I'm not sure how you can have an alliance of Anglo-Christian parties in England, Scotland and Wales as they claim to be and I'm surprised that the English Democrats are so keen to declare themselves a Christian party when one of their national council members and founder members, who happens to be one of their best people, is Jewish. There's even a Scottish and Welsh branch of the alliance! I could be wrong, of course, but I seriously doubt anyone will be unduly concerned about this schizophrenic alliance of British/Scottish/Welsh/English nationalist Christian (apart from non-Christians) unelectable political parties. The EU Commission is taking legal action against ... erm ... itself? National governments? Nobody? Not sure who but they're taking someone to court to overturn a decision by democratically elected (or half undemocratically appointed in our case) national governments to cap pay rises for EU officials at 1.85%. The EU Commission says that it's illegal not to give them inflation-busting pay rises of 3.7% on top of their already obscene salaries and is asking the EU Court of Justice to rule as such. There is little doubt that the EU Court of Injustice will rule in favour of the EU Commission because the judges, who are already on a salary of £215k, will be ruling on their own pay rises! As Nigel Farage says, "it would not take Nostradamus to predict the result of this particular case". It would be interesting to see what happened if an individual was to take their own legal action over this because the EU Court of Justice is not the independent tribunal guaranteed by the EU Convention on Human Rights. Lisa Duffy for Chairman Director? The Chairman of Young Independence, Lisa Duffy, has been put forward for the post of Chairman Director of UKIP. The appointment will need to be ratified by the National Executive Council (NEC) on Monday. Lisa hasn't exactly shone in the post of Chairman of Young Independence, with members complaining that she is out of contact for weeks on end. This is apparently due to work commitments - she juggles a full-time job and the Chairmanship of Young Independence. Presumably the post of Chairman Director of UKIP is a full-time, salaried position otherwise I fail to see how she can possibly be effective in this role. This is all just speculation of course, she might not even get the job and the terms won't have been confirmed yet. We will have to wait and see and give her (or whoever gets the job) the benefit of the doubt until they have the opportunity to prove their worth. The post is Director, not Chairman as previously thought. UKIP Swindon will be holding it's AGM on January 18th at 7pm. The venue is the South Marston Hotel and Leisure Club (formally the Nightingale Hotel), whose owner continues to support UKIP by allowing the use of conference facilities for free. The meeting will be to elect a new committee to take the group into the next local and general elections. It will also be used to make the final selection of the two PPC's. Chairman Greg Heathcliffe hopes all Swindon members will attend this meeting as the formation of this committee is perhaps the most important in the history of the Swindon Branch. Please note whilst non members are welcome, they will not be able to take any part in the election process, or speak to the event.